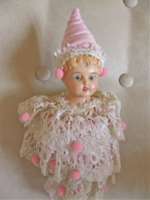 Fine early Celluloid antique musical Marotte doll with wonderful costume. 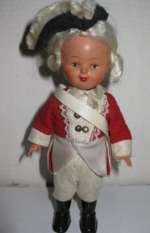 Early Celluloid antique musical Marotte doll. A Celluloid shoulder head doll with blue glass eyes, open mouth, four teeth, blonde mohair wig, is attached to torso that contains a musical box, with long turned stick with a flute. The marotte is decorated with original costume with lace trimming and matching clown cap. When twirled, the costume swings about and music plays. Condition: excellent. Fine celluloid head and clothes in wonderful condition.The music box functions well. circa 1900. High:13,7` (34 cm.) with hat. Vintage Rosebud baby dolls from the 50-ties. Here we have 3 "Rosebud" Dolls.Lovely nostalgic English Rosebud dolls from the fifties. Each is 18 cm long. Fine condition all over. NOTE: THE PRICE IS FOR EACH DOLL! I simply love this hairstyle from the 50-ties that this cute Danish Cellloid doll has. She is perfeckt. H. 22 cm. Vintage cute "Vouge Doll American ca 1950. Vintage cute doll marked at the back "Vouge Doll" American ca 1950.Dressed in original outfit with lots of underwear. 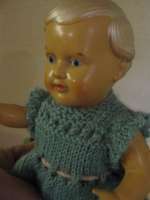 Size 18 cm / 7"
Turtlemark Celluloid doll from1940 -the Inge doll. Germany. Celluloid mecanical doll ca 1950. Original dress. 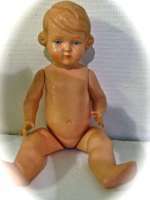 22 cm Celluloid doll ca 1950. Perfect condition.Clockwork. Wonderful all original outfit. 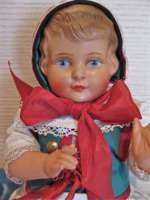 Lovely German Celluloid girl doll in original dress. ca 1945. 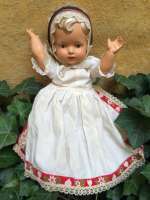 Lovely German Celluloid girl doll in original dress. ca 1945.Lovely face and and typical 40-ties hairstyle.Excellent condition. Size 23 cm/ 10"